Gemstone varieties are identified based on a common crystal structure and chemical composition. In the case of the garnet family, all garnets form as singly refractive cubic crystals, but there are slight differences in chemical composition that has led to the identification of 6 main varieties, known as almandine, andradite, grossularite, spessartite, pyrope and uvarovite. Pyrope garnet, for example, is a magnesium aluminum silicate, while spessartite garnet is a manganese aluminum silicate. 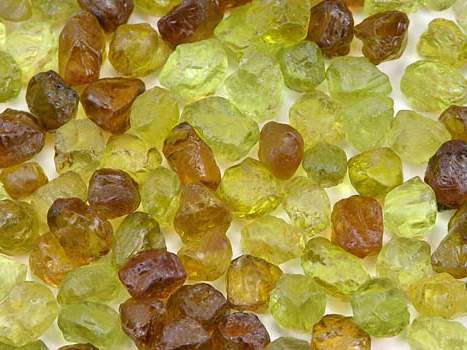 Grossular garnet is a calcium aluminum silicate, while andradite garnet is a calcium iron silicate. Generally the individual garnets are assigned to one or other of these 6 varieties. Thus tsavorite belongs to the grossularite species, and demantoid to the andradite species. However, there are also some intermediate or hybrid members. Rhodolite, the lovely purplish-pink garnet, is a mixture of pyrope and almandite. Color-change garnet is a mixture of pyrope and spessartite. Malaia garnet is a pyrope-spessartite-almadine mix. Though garnet has been known since ancient times, new hybrids are still being discovered. Most recently (in 1994) a mixture of grossularite and andradite garnet was discovered in Mali, in west Africa. Since these two garnet varieties are among the rarest in the family, this new find caused some excitement in the gems world. 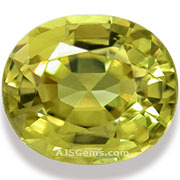 The Mali deposit was significant in size and came as a surprise, since Mali is not a country known for fine gemstones. Mali is one of the poorest countries in the world, and is primarily an agricultural economy, though it is the third largest gold producer in Africa. The Mali garnet is primarily grossularite, but the presence of andradite gives this gem a brilliance and fire which is reminiscent of the rare and expensive demantoid. Thus far this gem has only been found in its original location in West Africa, and the supply has diminished as the original deposit has been worked out. Mali garnet is mainly found in smaller sizes, usually under 1.5 carats, and the rare gems over 2 carats command a premium and are sought after by collectors. Mali garnet colors range from yellow to greenish yellow, and yellowish brown to brown. Lighter colors tend to show more fire or dispersion and the greenish colors are preferred over the brownish. Like all garnets, these gems are always untreated.